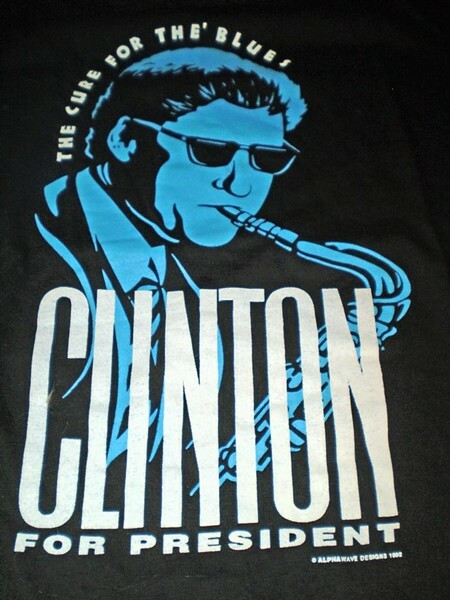 Within weeks, Dunbebin, then 30, created an electric-blue-on-black illustration (above) of Clinton blowing his sax, below the slogan, "The Cure for the Blues." He printed the design on a few dozen T-shirts and gave them to friends from the National Organization for Women, who were heading to New York City's Madison Square Garden for the Democratic National Convention in mid-July. According to Dunbebin, the T-shirts were an instant hit and quickly sold out, and his friends returned with numerous requests for more. Dunbebin, who was already employed full time as a graphic designer, was soon spending much of his free time printing T-shirts and pins he sold to Clinton campaign offices across the country, which in turn sold them at a mark-up. He would eventually sell more than 45,000 shirts. 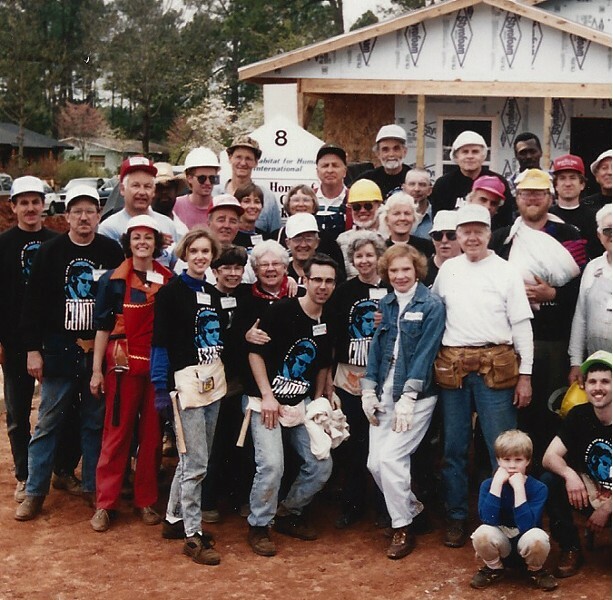 Dunbebin says his goal was to donate all proceeds to Habitat for Humanity, the international housing nonprofit organization founded by former President Jimmy Carter. He was so busy printing he got only 18 hours of sleep one week — and nine of those were in one day, he recalls. Another week, he printed up a bunch of shirts for a Democratic fundraiser in New York City's Tribeca neighborhood, then drove all night back to Maryland for work the next morning. "That’s the crazy crap you do when you’re 30 years old," he says. After Clinton was elected, Dunbebin's design was chosen by the inaugural committee as one of the official T-shirt designs of the January 1993 inauguration. "I walk over to introduce myself, but before I had a chance to say anything, [Carter] turns to Jane Fonda and says, 'Oh, this is Doug Dunbebin! He designed that Bill Clinton shirt!'" Dunbebin recalls. "It's kind of cool to have a former president of the United States introducing me to Jane Fonda." Dunbebin's efforts to meet Clinton himself were initially less successful. Soon after Dunbebin's design gained popularity, Magi received a phone call from Clinton's brother, Roger, who had seen Clinton supporter Linda Bloodworth-Thomason, of "Designing Women" fame, wearing one and asked for one himself. Not long after, Dunbebin discovered that the Clinton-Gore campaign store in Little Rock, Ark. was selling bootlegged versions of his design on pins and T-shirts. The slogan had been modified to "Sure Cure for the Blues" but otherwise the design was identical. Dunbebin asked that the merchandise be pulled but it kept selling. Dunbebin finally realized that no one in the Clinton White House had any intention of inviting him and his wife to play golf with the new president or sleep in the Lincoln bedroom, So he contacted a Little Rock attorney, who agreed to take Dunbebin's case pro bono and sue the campaign, as well as Clinton himself, for trademark infringement. Dunbebin charged that the campaign of sold shirts with his design but hadn't compensated him for it. Although the president was quickly dismissed as a defendant in the case — evidently, the Clinton-Gore store in Little Rock was an independent contractor unconnected to the official campaign — Dunbebin was able to recoup about $5000 in damages. Dunbebin's Clinton connection didn't end there, however. After the lawsuit was over, Dunbebin's company, Alphawave Designs, was asked to do some work for an event put on by the Washington, D.C. nonprofit, Women’s Legal Defense Fund, where Clinton was to be the featured speaker. Dunbebin created a similar sax-blowing image for the reelection campaign which read "ENCORE." This time, Clinton came up to him, shook his hand and autographed a poster for him, writing "With appreciation, Bill Clinton." Or so he thought. When Dunbebin's sister-in-law read it later, she asked him, "Does that say 'with appreciation' or 'apprehension'?" Images courtesy of Doug Dunbebin/Alphawave Designs.